The EU Charter of Fundamental Rights: Did the UK ‘Opt-out’ at Lisbon? When the Charter of Fundamental Rights of the EU was agreed, both the UK and Poland secured what was claimed to be an ‘opt out’, under a Protocol to the Lisbon Treaty. This, they suggested, meant that British people could not rely on Charter rights. Not so, however, said the Court of Justice of the European Union in the 2011 case NS v Secretary of State for the Home Department. Instead, the Court said that the Protocol simply explains the extent of Charter rights, and provides no exemption for the UK. The potential significance of this ruling was noted by Mostyn J in the recent case of R (AB) v Secreatary of State for the Home Department  EWHC 3453 (Admin) (our post here). He said that since the Human Rights Act did not incorporate all of the rights in the European Convention, the ruling of the Court of Justice had allowed the Charter to fill in these gaps. This, he contends, is despite the fact that the parties contracting in Lisbon did not agree to such an effect. In light of this ruling, Chris Grayling has suggested that he intends to challenge the current interpretation, which he asserts has ‘duped’ the UK into accepting the Charter via the backdoor, and has deprived the British public of a referendum on this issue. Commenting on these developments, Obiter J remind us that it was Labour who negotiated to so-called ‘opt out’ from the Charter, and that as such, this is not simply a Conservative issue. 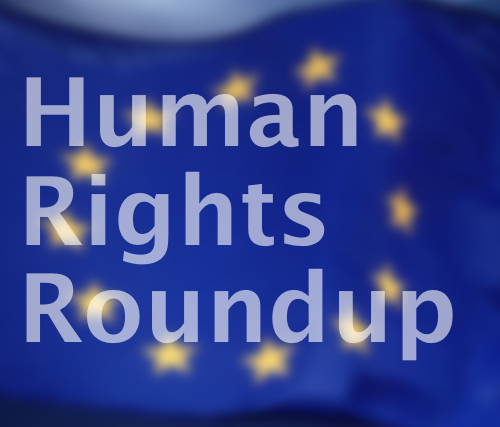 Mark Elliott has also notes the importance of these cases, suggesting that, even if the UK does repeal the Human Rights Act, it may be more difficult to get rid of European rights than first thought – see further Rosalind English’s post. The President of the European Commission, Jose Manuel Barroso, caused controversy in the UK this week after he called for the UK to endorse ‘Churchill’s vision of a United States of Europe’, in a speech delivered in Zurich entitled “From 1946 to today – a European success story. Why leadership matters’. The speech provoked a strong reaction amongst the UK press, and also from the leader of the UK Independence Party, Nigel Farage, the latter of whom accused the President of the Commission of ‘hijacking’ Churchill’s words and taking them out of context. Jon Danzig has commented on the affair, suggesting that Churchill was not a Eurosceptic, nor would he have voted for UKIP if alive today. In his recent post on the Euro Rights Blog, Danzig points to Churchill’s endorsement of a Franco-British Union as evidence of this fact, and argues that the wartime leader supported the idea of the EU. Faced with the decision of the Supreme Court in Al Jedda  UKSC 63, which said that section 40(4) of the British Nationality Act 1981 prevents the Home Secretary depriving someone of citizenship if it would render them stateless, Theresa May has announced her intention to repeal the statutory provision in question. A post on Human Rights in Ireland this week considered the potential impact of these proposals, arguing that it would enhance the already wide discretionary powers that the Secretary of State has in this field. Although the UK have tabled reservations to some of the international legal provisions against statelessness, it is suggested by the authors that the current proposals go beyond these reservations, and have potentially severe consequences for a wide category of ‘suspects’. Last week, in a post on the UK Human Rights Blog, Adam Wagner argued that the a correction by the Daily Mail to a headline which misrepresented the compensation ‘handed out’ to criminals by the European Court of Human Rights was ‘too little, too late’. In a similar vein, this week Guy Taylor, from the joint Council for the Welfare of Immigrants, has argued for the need for greater press accountability in light of a series of inaccurate publications on migration. Looking at the press through the migration lens, he goes on to suggest that that ‘the outfit that replaces the PCC’ (Press Complaints Commission) must ‘have migration representation included’. Paul Mahoney, the UK’s judge at the European Court of Human Rights, has spoken to the Law Society Gazette about the continued importance of the Strasbourg court in insuring that the states do not slide back to totalitarianism, how the court will overcome the challenges it faces in the future, and the role of Strasbourg case law as ‘almost the common law of Europe’. The Committee on Legal Affairs and Human Rights of the Parliamentary Assembly of the Council of Europe have published a new report on the need to reinforce the independence of the European Court of Human Rights. The Telegraph ran an article entitled “The Government’s attack on Barristers is a looming disaster”, commenting on what is suggests is the increasingly inevitable clash between the Ministry of Justice, which has proposed cuts to fees in order to reduce the legal aid budget, and the Criminal Bar Association. The London School of Economics is leading a new project, under the direction of Professor Conor Gearty, which aiming to ‘crowd-source’ a British constitution. In essence, the project seeks public participation in shaping the values that a potential codified British constitution would be shaped by. In light of this, David Allen Green has taken some time to reconsider the nature of the British constitution, which he describes as a ‘conceptual mess’. University College London and King’s College London recently collaborated to screen the film ‘The Response” – a courtroom drama based on the official transcripts of the military tribunals of Guantanamo Bay. In an article published on the European Journal of International Law’s blog this week, Antonio Coco discusses the Supreme Court case of R v Mohammed Gul, which considered the definition of terrorism in situations of non-international armed conflict. He notes that, although the Supreme Court recognised that the wording of the domestic definition of terrorism was of concern, it nonetheless went on to rely on that definition to uphold the conviction in that case. Robin Hopkins, barrister at IIKBW, examines two recent decision of the Upper Tribunal which consider whether or not an obligation to disclose information, where the disclosure would involve a breach of confidence, remains after the death of the person who confided the information. Upheld the decision of the Radio Advertising Clearance Centre, which found that an advert by a Christian publisher seeking the experiences of marginalised Christians contravened the ban on political advertising under the Communications Act 2003 (Elias LJ dissenting).